Costume designers know that we can take on challenges because everything we do is done ‘in house’. One very normal day was suddenly changed into one of those surreal days. A frantic telephone call from the costume designer Anne Hollowood. She was desperately in need of a few dresses – 1200 BC Egypt. 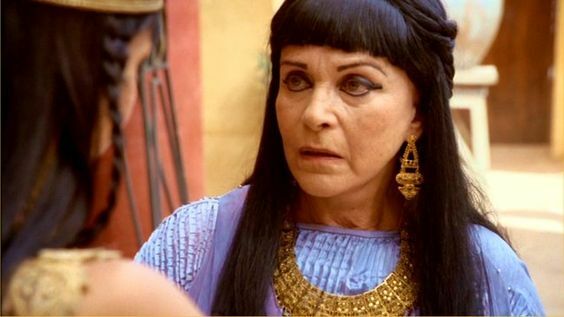 Her story was that while filming in Tunisia the set was flooded – a biblical story perhaps? Could we get some of the pleated dresses and soft chiffon over pieces to them as quickly as possible. We were told that one actress was Claire Bloom but they were not allowed to reveal the name of the second actress. How intriguing – we conjured up all sorts of exotic possibilities – all wrong of course. This lady was very specific about the colour of the one garment that she wanted. It has to be the colour of a Citroen CV – a blue. Now it is very difficult finding a specific car in a small market town car park – but we did try. There were no Citroen CVs let alone a blue one anywhere, not in the car parks, nor the side streets – nowhere. We had a perfectly beautiful length of light blue fabric already painted and pleated – the need was urgent – that is what she got. It turned out that the actress was Padma Lakshmi – at the time married to Salman Rushdie (with a fatwa hanging over him that could have included his wife) and they were filming in a Muslim country. We were rather annoyed though when we read an interview in which she claimed that she had designed the clothes! The story continued – I am not sure of the timescale, but after the film had been released we had a call from a friend in Canada. A keen purchaser of our clothes particularly on eBay. He had found the costumes for the film and recognised ours amongst the listings. He made me promise not to bid on our dresses and he would not bid against us for the outfits worn by Omar Sharif and Dougray Scott. He was also prepared to let us have the ‘jewels’ that went with the frocks for our archives. 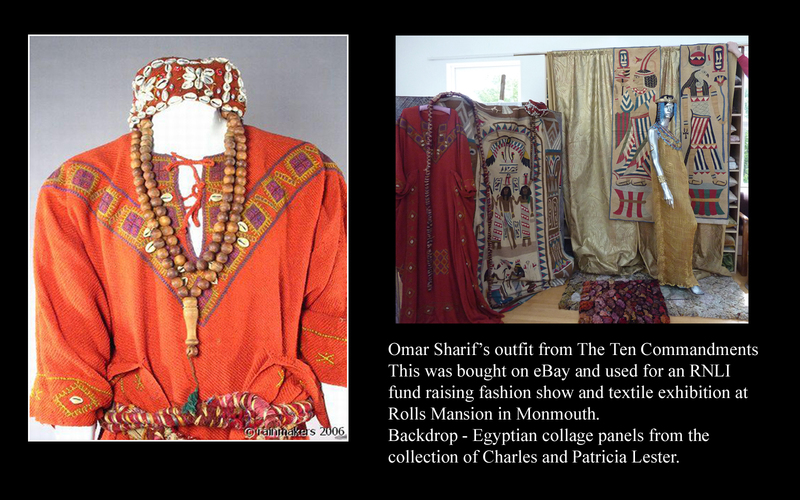 We can always make new pleated dresses and chiffon nonsense pieces – but we could not otherwise have obtained the Omar Sharif’s costume, hat and worry beads nor the complete outfit worn by Dougray Scott in his role as Moses.